Not all proteins are naturally structured, and those that aren't are called intrinsically disordered proteins (IDPs). While they don't have structure, they do have many important roles in cell biology that are still being fully understood. They are often found mutated in many cancers at places that control the expression of genes and intra-cellular communication. In this work we show that a common chemical modification to IDPs known as phosphorylation can cause one IDP know as KID to change it's behavior. We further show that this could have important consequences for protein interactions, which affects all kinds of things like what genes are expressed and how signals are passed inside the cell. 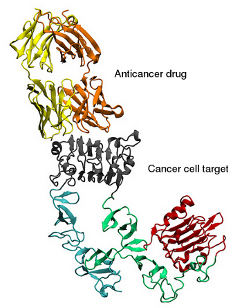 Extracellular S468R mutation of the epidermal growth factor receptor (EGFR) was recently identified as the cause of resistance to cetuximab, a widely used drug in colorectal cancer treatment. Here, we have determined the binding free energies of cetuximab's Fab V(H)-V(L) domains and endogenous EGF ligand to wild type and S468R EGFR by high-throughput molecular dynamics. This work provides a possible mechanism of resistance in terms of increased competition, an hypothesis that can be further validated experimentally. The SH2 is a protein domain involved in protein-protein interactions. This particular domain plays a major role in cell communication on the sigalling processes for cell growth and development. 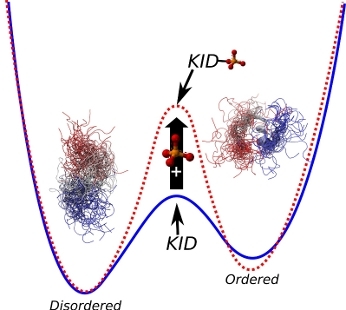 However, the end goal for running such simulations is not to expand the knowldege on this particular system, but to use it as a model for developing methods to calculate protein-protein binding affinities. Ouch! The connection with the server failed. Check internet connection, update your browser or contact the administrator.